We first brought you separate adventures in this post pretty much 2 years ago at this same time. Well, this weekend was similar...so here we go again. Friday Night was pretty crazy with some patio sitting with the pup. We went to The Other Place and had dinner and a couple of drinks before heading home. I know...we were party animals!! I was supposed to run a half marathon on Saturday, but lucky for me-it got rained out! Apparently lightning is dangerous...even in running events! Porter pretty much had the best time-somewhat because he got to go with us to dinner and mostly because he got to catch french fries that were tossed to him! Since my half was rained out, I waited until it was 75 and humid to go out for a shorter long run. Everything is really pretty, but it was definitely hot out! I'm not sure that I'm ready for summer running! Saturday night, Bobby and I celebrated Steve turning the big 4-0!! Happy Birthday Steve! Krystal had BBQ and the cutest mini donuts for the party. He clearly loved us singing happy birthday to him. You can't tell in the pic, but the little candles are "40"s. It was a great time, but we could only stay for a bit. We had plans to check out the movie Deadpool 2. It did not disappoint. Lots of funny references and comic book jokes. I probably understood maybe half of them...and that is a stretch. Regardless, we laughed a lot. I was pretty proud of myself for staying awake through the entire movie since it started after 9pm! :) Must have been the fact that we had drinks (at the theater...didn't sneak them in this time). That's it for me...Sunday included adulting and showing off my mediocre volleyball skills at Corp Challenge volleyball pool play. No pics of any of that. Andrea here: I had a great weekend visiting family in Eureka, Missouri. Billy and I started Saturday morning with a long walk with the dogs and our niece Darcy. She took us on a hilly walk to train for the mountains when we go to Colorado in July. After our walk we all headed to Sarah’s Cake Shop on Central, it’s a delicious must have spot where we ordered nitro coffees that were amazing. For the day my brother-in-law Phil surprised us with a picnic and several wine tastings. Daniel and Darcy were good sports as we enjoyed our wine crawl! My favorite stop of the day was Augusta. We purchased bottles of rose and a red blend. The winery featured live music and ample outdoor seating. We had enough time to relax on the patio and enjoy wine, music and our picnic. We were checking in on the radar as a storm was heading in. Luckily we finished up and evaded the pouring rain and thunderstorms! Its always nice to visit with family, we had a wonderful time making memories. 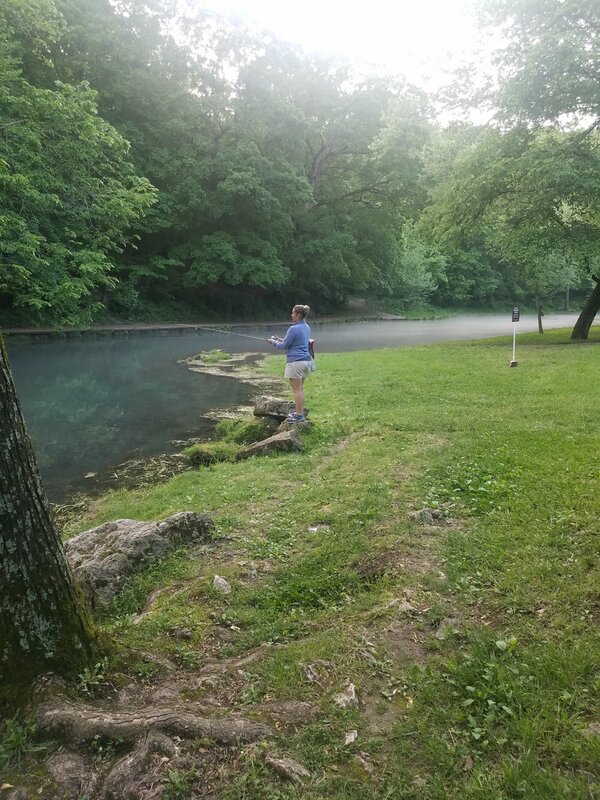 Stephanie and I headed to Meramec Springs Thursday night to meet up with some of my family for our annual fishing trip. The last couple of years we have gone to Bennett Springs, MO so we were checking out a new place. We drove through some pretty awesome clouds on the way...thankfully NOT a wedge tornado! We made it to the state park around 9pm - just in time to enjoy the campfire. Saturday we awoke to some intermittent rain and decided to hang out around the cabin. We had a covered porch which was great to sit under and take in the views of the park. 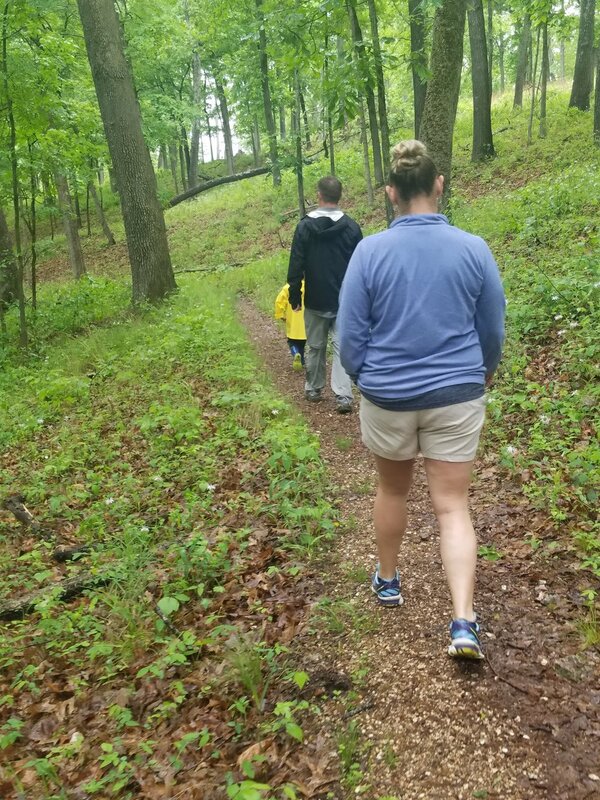 Once the rain died down we decided to take a little hike with my fearless nephew (who is only 4) at the helm. We were hoping to see lots of wildlife but only managed to see a frog and a turtle...and several ticks....yuck! After our hike we drove over to St. James, MO to find a place to eat. After trying to find 2 permanently closed BBQ joints, we headed to Missouri Pizza Company. It was a cute pizza place in an industrial building with big garage doors that allowed an open air feel. 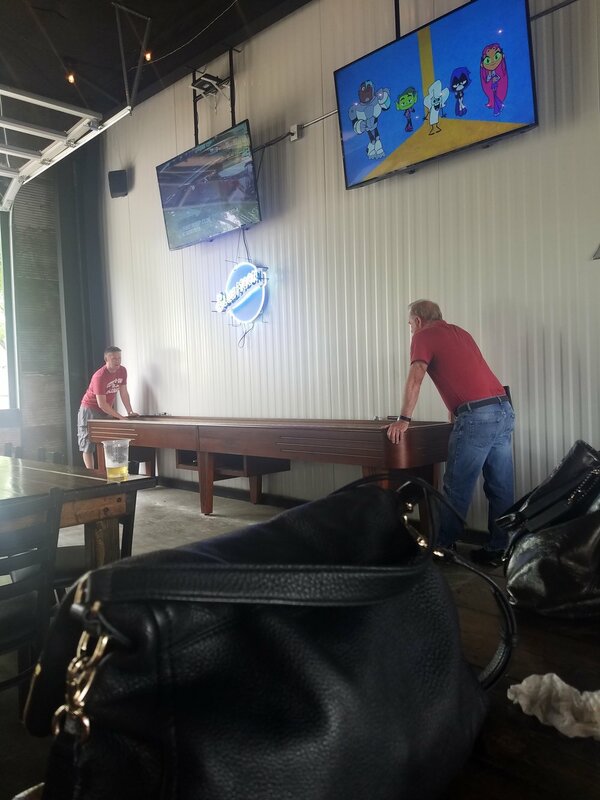 There were several TVs and games such as Foosball and Shuffle Board. Stephanie ordered the Wayne Eater BBQ pizza with chicken and pulled pork. I had the same but with only chicken. They were both really good and a small pizza could easily feed me for 2 meals. I also heard the spicy wings were legit! We shared a few pitchers of beer while playing the games. It was a fun afternoon in St. James, MO! After pizza, it was time to try a little evening fishing. We headed to the spring and got our poles ready. The spring is really pretty and definitely different from Bennett Springs. We could easily fish from the shore and didn't necessarily need waiders. After a some time with no bites or even SEEING a fish, I was over it. It wasn't a prime time to fish but glad I got to see the spring! We headed back to the cabin for more time around the fire pit and SMORES! Do you know how good a smore is when you haven't had one in forever? Trust me...they are very good! and my brother lighting it! 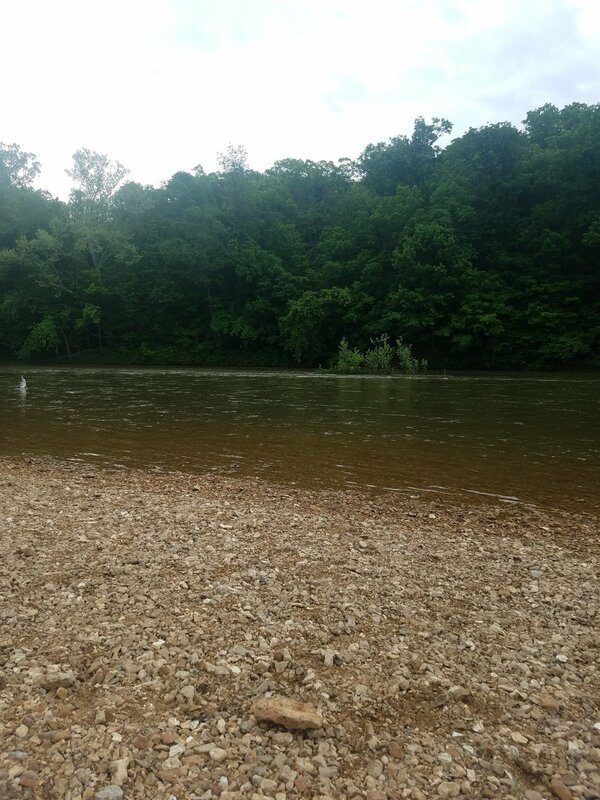 Saturday we headed down to a rocky beach along the river to finally enjoy a break in the rain. 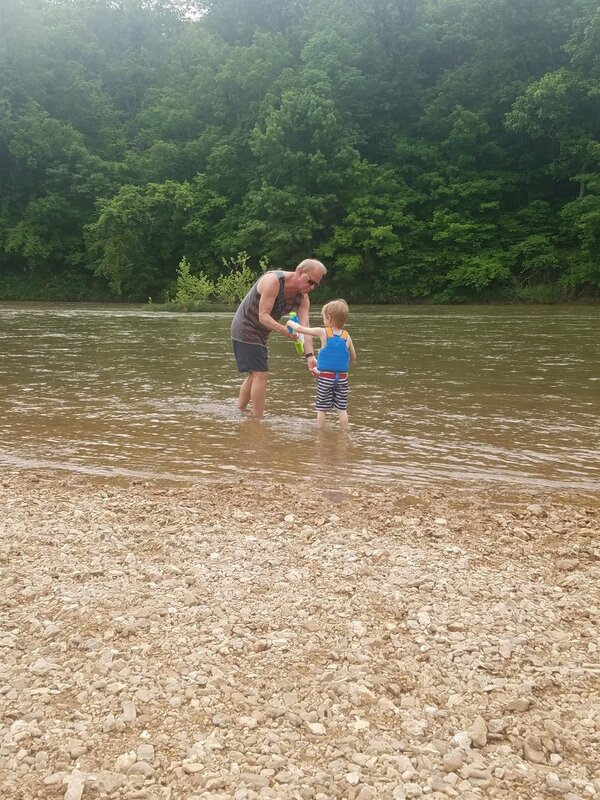 We had fun dodging my nephew's squirt gun, skipping rocks, and exploring. Unfortunately, a storm swept in pretty fast and ruined our fun with a downpour. 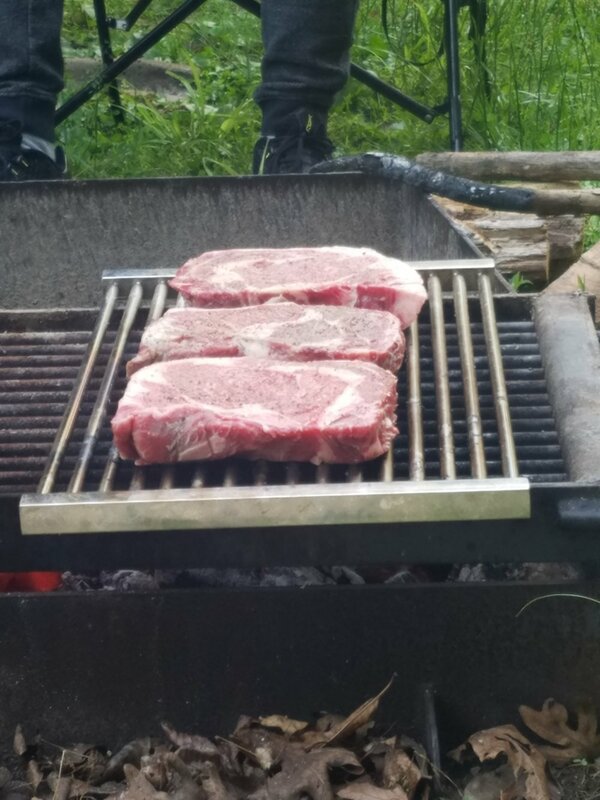 Thankfully, it let up just enough to cap our evening with some delicious (and HUGE) steaks cooked over the fire. We had a great time on the trip even if we didn't get to fish much. I promise we will be back to our regular joint adventures next week!